I already have the big kitchen, even though I want to redo some of the things the previous owners made a couple of years ago..
Merino sheep...yes! A must have to round out the fiber collection! Your kitchen sounds lovely. What did the previous owners do? I'm always surprised at the strange things people do when decorating. It's why I can't watch those shows where they decorate someone's home. I want to yell at the screen, "Why...WHY are you doing that?" One one show, a couple were endlessly complaining about a really beautiful lamp we both thought looked great, and the person helping them redecorate had found a very ordinary blah lamp to replace it. LOL, the cast-offs were better than the new things for decorating! Absolutely...we must have nice large craft rooms...this is a non-negotiable point! Shelves of fiber in every possible color...hee hee, are you drooling, too? Previous owner installed two ceramic hotplates and two gas.. o.O It looks awfull and I cannot fit one pan and two pots on it because they are kind of small.. They have not finished the kitchen completely.. There is one countertop made from granit (LOVELY), and the other one is some kind of laminate.. So we need to exchange the laminate one with ganite as the other one... It is perfect for hot pots and pans when they need to cool off because to can just place them on the countertop with nothing underneath.. This is the floorplan of the house.. The kitchen (køkken) is as big as the living room (stue)..
Aaaaaand yes... Drooling all over the place..
That sounds crazy, to have two ceramic hot plates and two gas! And if you can't fit pots on it, then it's a fail, IMO. I see why you want to change it! Induction is cool. We did discuss it but ultimately opted for gas because the problem with induction is that if one element goes out, you have to scrap the entire cooktop. Unless that's changed! Anyway, we also didn't want to buy all new cookware, and we got a really good deal on the stove we bought. It has a lot of features hubby likes to use. Oooh, granite! So jealous. Ours is laminate...it's in bad shape, so we'll ultimately have to replace it, but for now it stays because of a cracked floor joist, which keeps us from moving the stove to where it's ultimately going, so the counter space will be very different. It doesn't pay to redo the countertops twice. I love the large living room/kitchen like that! Jealous again. Our living room isn't terrible, but because it used to be a dining room, it's not very roomy. And I may have mentioned the kitchen, which has few countertops, so it's not close to a dream kitchen, sigh. Actually, the house was pretty messed up for years, according to the neighbor, so it's not really surprising that the kitchen and living room are a bit small. I'll see if we have some kind of floor plan to show you, but am guessing we don't. Hee hee, knew you'd be drooling! Is that a dream stash or what?! In Denmark a lot of the induction plates comes with a 10-15 year warranty - so I'm not concerned about it.. In 15 years there will be some new cool stuff I guess..
We will properly change the hot plates whe we change the countertop.. :p It's was easier doing it that way..
- And YES.. Dream stash.. All kinds of fiber, in all kinds of colours.. That's a need to have room, and my nail stuff could get a small corner in the room.. Dogs not allowed..
Would love to see a floorplan of your house.. It would be neat..
Wow, a 10-15 year warranty?! We get one...three if you pay a little more. I think it goes as high as five if you pay for it, but I've never heard of more than that. We got three on our appliances. Hubby felt more wouldn't be worth it. Glad to hear changing the hot plates isn't going to be a big deal! So nice it can be done at the same time as the countertop. Love the idea of bigger bathrooms! But then what will you do with the washer and dryer...will they end up in the bathroom, or will they be moved elsewhere? Will it help to move the driveway? Love the idea of you getting a yarn room...though I'm wondering why he wants to move the driveway in the first place? Or is it a romantic thing, that he wants you to have a yarn room? Holding my breath that you'll get your yarn room! When you get it(! ), you'll have to take pics. Microwaves and small stuff like that has a normal warranty period of 2 years or so, because they are so cheap here.. Since Danes are like this, most companies will extend the warranty period here in Denmark to keep us happy.. Especially because Danes are good at spreading out bad experiences.. If things work perfectly, we might tell a couple of people that migt tell a couple and so on.. But if we have a bad experience, we will tell maybe 30 people, who each migt tell 30 people.. All those people will not buy anything from that company ever again.. Can you follow where I am going..
Denmark is a small country, but bad news travels fast.. :p So companies usualy goes the extra mile for us here..
Washer and dryer will be located in that big bathroom.. The two rooms in the 'bryggers' is actually seperated by a wall with an opening in it, like a door, but with no door in it.. So the washer and dryer would still be seperated from the new bathroom.. I don't know why he wants to move the driveway, it is not a romantic thing, because that man does not have a single fiber of romance in him.. Seriously, I am not kidding..
His idea of romance is sitting on the couch, under the same blanket, watching some tv show of some sort not talking at all.. :p He is weird that way, but it is okay, since I don't do romance either..
Before I forget, I neglected to mention that I asked if there's a floor plan of the house available...there isn't. We'd have to draw it out ourselves. I'm interested! I'll ask hubby next if he still has measurements he made of the rooms. If he does, I'll measure...if not, I'll borrow his measuring thing that I bought for him one year. I'd really love to draw up a floor plan. How amazing that your warranty periods are so generous! 25 years on a mattress would be unheard of here. I can understand a microwave with only two years for a warranty...I imagine smaller items being so easy to replace makes them items people buy again without much thought or concern. Yeah, honestly I wouldn't want to buy from a company again if their item broke down. I've done that with small stuff as well as big things. I won't even buy a food item if I don't get satisfaction from a company. It's so not worth buying if a company makes an inferior product or isn't going to be sensitive to problems. Wow, that's so cool how you guys can keep companies honest! Love, love, love it. Here if you threaten to boycott or spread bad info about a company, they laugh it off, knowing you might get the attention of a handful of people at best, unless someone takes on the task and gets it on TV or something. I love the way you've planned it that the washer & dryer will be separated from the bathroom, but still technically in the room. It's wonderful how you can have the best of both in a bigger room! Ha ha ha! I thought maybe he was trying to make a romantic gesture by getting you a yarn room. Oh, well, if you do get one by him moving the driveway, does it matter? Hee hee, I say "mission accomplished"! 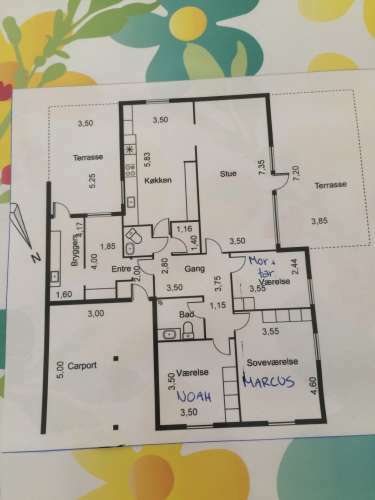 It is great to have a floorplan, especially if you want to sell the house again some day.. Then you can give potential buyers a floorplan to take home..
That is how it usually goes here in Denmark, and it works.. Measuring thing Hahaha.. Do that, you'll be glad you did it in the end. It's great that the companies are like this here.. But if 6 million people stops buying their products it doesn't look good on their budget..
That is a great idea to give a floorplan! Thanks for telling me about it! Love that it works, too! BTW, hubby does have his measurements, so he'll give them to me. Though now I have a tape measure down here. Not as nice as the digital measuring thing (LOL), but it will work for anything he might have missed, such as a possible small area in front of the basement door. But he thinks he might have that one, too. LOL, I still can't remember what that measuring thing is called! It's true...I can't see how a company would stay in business with pretty much the entire country boycotting their products! Your consumer council sounds lovely. We were supposed to have something similar here, but the politics got so ugly, the organization lost its "teeth," so to speak. So we consumers are pretty much on our own, sadly. Hopefully something really egregious would be tackled, but I wouldn't hold my breath. Not just for products, but it would be wonderful to have some help over services. Like our ongoing tree saga. If we had someone on our side, that tree would already have been gone on the basis of it being a danger. But we don't, so we wait. It's an absolute nightmare. True, the important part is getting the room in the first place! How is definitely not important. Well, I hope it's sooner for you than later. Bzzt...bzzt...sending good thoughts and vibes right now! A good memory is a great feature in a SO! LOL, now hopefully you still like whatever it was that you liked 6 months ago! I don't remember what the measuring thing is called.. I know what it is called in Danish 'målebånd' but directly translated that is measuring tape, which I am not sure is correct..
We have some laser thing that measures by laser.. I have no idea what that is called either.. Maybe laser measuring thingy..
Measure thingy / or the correct word for is - same same I know what you mean..
Good memory or not, we have the same taste in stuff - more or less anyway.. So it is easy for him getting me something that I want when I tell him that it is present time <- aaaaaand yes, I actually do that.. The conversation sounds something like this: "Hoooooneeeeeeey?"...... "Yes, what!?" ........ "Since my exams went so well, I do belive it is present time... Need my presents you know".... "Oh.... Yeah sure..."
Luckily I don't have to remind him about birthday og christmas.. ROFL..
Hahahaha, I was referring to the laser one, so I like your ultra technical term, "laser measuring thingy." It at least gets to the point! Who cares about those fancy terms, right? LOL! Glad you two have a communication system set up that works well! I don't generally ask for things, but I do bargain. For instance, hubby wants me to hem his pants. So I contacted a dry cleaner in the area and asked for their price. He'll pay me that much. Honestly, I despise hemming pants...but for a money, I'll do it. Better in my pocket than someone else's if it's something I can do! Those vases are really cute! You and he apparently have lovely taste. The statue looks nice and fits right in! 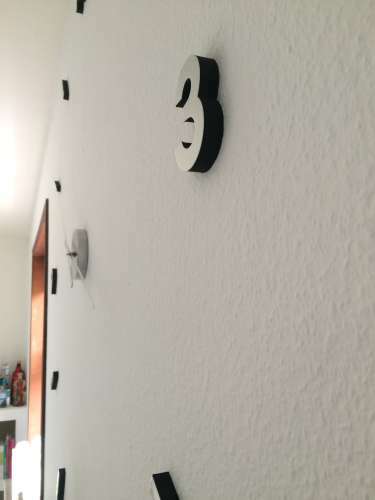 That clock built into the wall is interesting, too. Did you do that, or was it already there? What we used to do (and still occasionally do) is make lists of what we like for the other person to choose from. So sometimes we'll go off of the list and try something interesting. Luckily, the times I've gone off of his list, he's been pleased. He usually likes hardware store crap, tools, blah, blah, blah. I don't know what some of it is (and some I do), but as long as he defines what he wants, I can do pretty well. One time I went off of his list and got him a thing for working under cars, called a "creeper." It's a slightly padded thing with wheels that makes it more comfortable than simply laying on the ground. He loved that, said he'd never have thought of it in the first place, nor would he have bought it for himself. I was so happy to get him something useful that could make his life easier. He's gone off of my list to get me things like beading tools. And some of that stuff is available at the hardware store! Gotta love the convenience, huh?! I actually hated the deer statue at first.. Thomas salvaged it from my grandmothers apartment when she died.. I really hated the thing.. He got 2 small ones too.. I am soooo bad at making lists.. Mostly because I get annoyed after some time and go buy the things on it anyway.. I am really impatient..
BTW - we need more emoticons here..
Awww, how sweet that you grew to like the deer statue! I love that you named it, too. Sounds like something I would do! You're so right about the deer going with the vases...really a lovely combo. 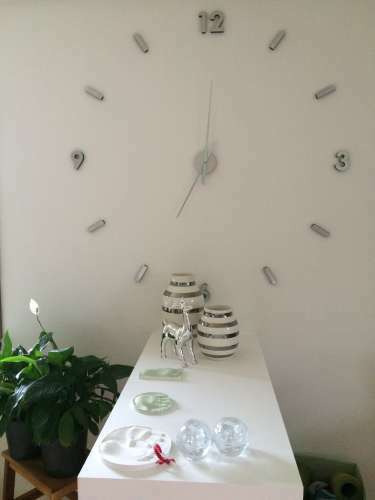 I haven't seen a lot of kitchen-y things that I like, nor do I like a lot of clock things, but a floating clock in the kitchen idea is so interesting. Looking forward to seeing any other pics you take of the clock...or anything else! Oooh, speaking of interesting ideas...remember I had mentioned the lack of a dining room, due to the previous owners having changed the dining room into a living room and making the living room into an entranceway/bedroom/bathroom? We had discussed but quickly discarded the idea of making the entranceway into a dining room because of that bathroom. But then I had the inspired idea that, sometime later when we get to it, we could make what is the open front porch now into a glassed-in porch, more of a part of the interior of the house than the exterior. Well, then I had an even better idea...we could extend the front porch out a bit, maybe a foot or two, and then that could be our dining room. It would look out onto the street (okay, the street isn't tremendously exciting, LOL, but it's not ugly, either) and then in the winter we can watch the snow and in the summer we can sit nice and cool in the air conditioning. Ha ha, once we have air conditioning. So it will have to be after the central air is installed, of course. With the doorway (which I would keep as a doorway into that front porch room, perhaps just replacing the exterior door with a regular interior door), we could keep the porch separate from the entranceway, and thus, separate from that bathroom. And it would be far prettier than eating in the kitchen. It wouldn't be as roomy as the original dining room, but it could still be made nice. And it would be wonderful to have curtains up in the windows to keep the room private during any nighttime dinnertime. It's a very long-range plan. LOL, I'm not great at making lists, either. I used to think of something and forget it by the time I sat down at the computer to write up the list (ugh, writing things on paper is worse, because then I'd lose the papers!). It's a bit easier with a cell phone. If I want to remember something, I email it to myself from the phone. Hee hee, you'll have to tell me how it goes with the word "creeper" instead of "skateboard"! I love to do that kind of thing, too. I love to pick up words from other countries and use them. Sooooooo much fun! I would use skateboard here, but I doubt many people of my acquaintance have heard of a creeper in the first place, LOL. It's pretty specific to auto repair. The people I know may have heard of a crochet hook or size 10 cotton thread...creeper would probably confuse them, never mind skateboard! Ha ha, however, I might try "skateboard" on hubby! LOL...the hardware store is great for some beading tools. They have pliers and things like that. Sadly, they have nothing for crochet. Though they've gone the way of many "home improvement" stores these days...they have home decorating things. Hardware stores traditionally didn't have those kinds of things years ago. I remember accompanying my father to hardware stores back in the day and, yawn, they were soooo boring. They had dirty, greasy stuff (ha ha, or maybe that's just an inaccurate memory from the mind of a bored young girl) and they didn't spark the imagination. Anyway, now that hardware stores are more "home improvement" oriented, they're pretty hip. They have scrapbooking things at times, and I even saw a knitting book there once, I think. Once. But most of the time it's home improvement/home dec stuff. There was a really nice book on crafting for the home, all kinds of fun little items to make to decorate. Then there are wall decorations and things like that (ooh, maybe the hardware store would have a floating clock decoration!). Argh, how frustrating that your boyfriend doesn't understand crafting things! It's okay, my husband doesn't understand all of it, either. I have to really describe specific things very, very well, or he won't get it right. He wants me to go with him or at least send him some item number or whatever, so he can pick something off the shelf or order it! He's better about books. If I tell him the books I want, he might pick out something off the list, but usually he'll find something interesting. Yes, you're right...we do need more emoticons! I had started working on it and then got distracted...thank you for the reminder! If I don't get back to it soon, whack me over the head with something soft, okay? I actually got the clock in a hardware store thing.. They have all sorts of stuff in there.. It is a great store.. I laughed a bit when he came home with knitting needles with a wire between.. I asked him why he didn't ask for help at the store and he said: "They were busy - I didn't want to disturb"
Mine is better with books too - at least there is a title ON the book..